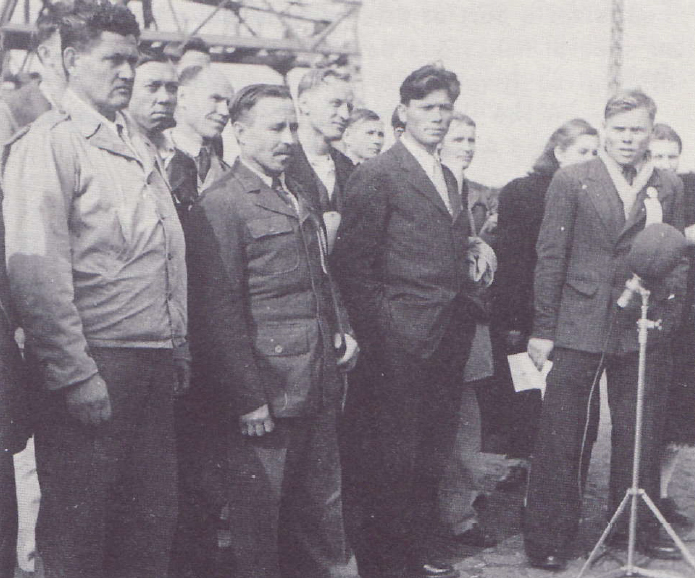 Image from “Epic Escape from Reds Finally Ends in the U.S.” Life 32, no. 15 (April 14, 1952): 36-37. In Chinese Central Asia, or Xinjiang, the geopolitical and social consequences of the Cold War were manifest. Though Xinjiang is isolated—situated farther from an ocean than any other point on Earth, for example—from as early as 1944 it was the site of an intense competition for resources, information, and influence among the United States, the Soviet Union, and two Chinese regimes. Some of the earliest and most poignant manifestations of the Cold War, including nuclear rivalry, were made evident in Xinjiang. But Chinese Central Asia was not just a Cold War frontline; it was also a Cold War shatter zone. The enmity among and competition between the great powers produced severe social displacement and dislocation and affected countless lives in Xinjiang. Indeed, Chinese Central Asia is representative of how the Cold War was a truly global conflict, which was intimately experienced by ordinary peoples and often times in the places most far removed. Emblematic of Chinese Central Asia’s tumultuous encounters with the Cold War, in the late 1940s and early 1950s a group of ethnic Russians from Xinjiang endured extreme physical and emotional harm as a result of their interactions with the United States, the Soviet Union, the Guomindang (GMD), and the Chinese Communist Party (CCP). Described as “stocky and weather-beaten” by the New York Times, the group arrived on America’s eastern seaboard in March 1952. 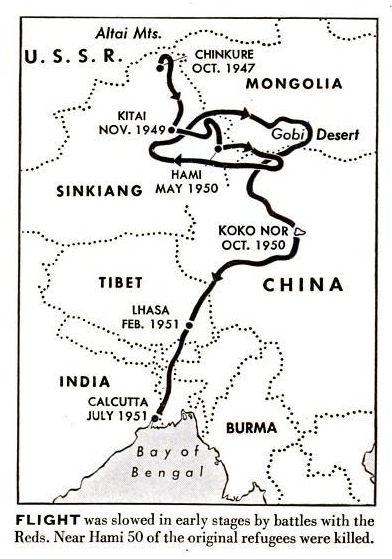 They had canvassed Xinjiang and Tibet on foot and horseback, staving off hunger, brutal environments, and attacks by Chinese, Soviet, Mongolian, and Tibetan groups along the way. Though more than 100 Russians from Xinjiang had set out with this group initially in 1947, less than twenty-five percent ever arrived in the United States. The others perished. Dubbed an “epic escape from reds” culminating in “freedom and an English lesson” by Life magazine, this was not just an attempt to evade the iron curtain. Rather, it was the group’s association with the Central Intelligence Agency’s (CIA) man on the ground in Xinjiang, Douglas Mackiernan, which destined the group to nearly die on the Central Asian steppe. 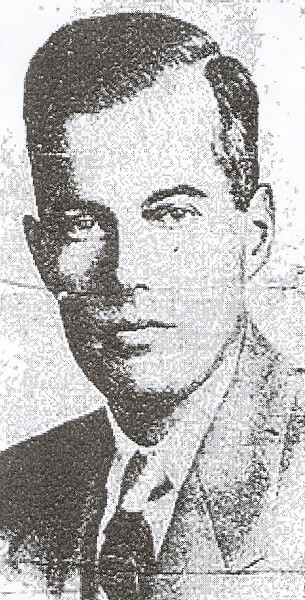 Mackiernan had been dispatched to the region by the CIA in 1947 to track the Soviet nuclear program, and his clandestine work was supported by the Russians. But when the American mission in Xinjiang was abruptly shut down in 1949, the Russians were abandoned and forced to fend for themselves in potentially hostile territory. The fact that these Russians worked closely with a member of America’s intelligence forces—the first to die in the line of duty no less—was never revealed to the American public. Clearly, the consequences of the Cold War came early to Xinjiang, a region rarely associated with the onset of Soviet-American rivalry but perhaps a more potent example than Europe in revealing the “struggle for the soul of mankind.” Specifically, it is the aim of this paper, through a narrative retelling of how this group of Russians encountered and experienced the Cold War, to depict the limits of the “long peace” (or even a short peace) paradigm for regions outside of Europe. The outcomes of the strategic rivalry and competition between the Soviet Union and the United States in Xinjiang were violent and tragic, not necessarily or exclusively for these countries but especially for their allies and accomplices. As a corollary to elucidating some of the social consequences of the Cold War, this paper also demonstrates how events transpiring in Xinjiang have corresponded to, connected to, and even influenced events at the national and international levels. Commensurate with Xinjiang’s past as an ancient “crossroads” of empires, societies, and peoples, this paper embarks upon a historiographic turn in which Xinjiang’s twentieth century is embedded in the global and the transnational. The White Russians arrive in New York City, 1952. Image from The Tolstoy Foundation, Thirty-Four Years of Assistance to Refugees (New York: The Tolstoy Foundation, 1972). Daniel Garcia-Castellanos and Umberto Lombardo, “Poles of Inaccessibility: A Calculation Algorithm for the Remotest Places on Earth,” Scottish Geographical Journal 123, no. 3 (September 2007): 227-233. See Odd Arne Westad, The Global Cold War: Third World Interventions and the Making of Our Times (Cambridge: Cambridge University Press, 2005); Michael Szonyi, Cold War Island: Quemoy on the Front Line (Cambridge: Cambridge University Press, 2008); and Jeffrey A. Engel, ed., Local Consequences of the Global Cold War (Washington, D.C.: Woodrow Wilson Center Press; Stanford, CA: Stanford University Press, 2007). “Epic Escape from Reds Finally Ends in the U.S.,” Life 32, no. 15 (April 14, 1952): 36. Melvyn P. Leffler, For the Soul of Mankind: The United States, the Soviet Union, and the Cold War (New York: Hill and Wang, 2007); John Lewis Gaddis, The United States and the Origins of the Cold War, 1941-1947 (New York: Columbia University Press, 1972); Melvyn P. Leffler and David S. Painter, eds., Origins of the Cold War: An International History (New York: Routledge, 2002). John Lewis Gaddis, The Long Peace: Inquiries into the History of the Cold War (New York: Oxford University Press, 1989). For implicit criticisms of Gaddis’ approach, see Heonik Kwon, The Other Cold War (New York: Columbia University Press, 2010). See also Justin Jacobs, “Empire Besieged: The Preservation of Chinese Rule in Xinjiang, 1884-1971” (Ph.D. diss., University of California, San Diego, 2011). James A. Millward, Eurasian Crossroads: A History of Xinjiang (New York: Columbia University Press, 2007).